The region of the Spercheios valley in central Greece features certain environmental, geomorphological, agrarian, and geopolitical parameters that, if considered collectively, may be construed as diagnostic formative elements of Mycenaean palace states. The Spercheios valley, stretching for some 80 km east-west, is wedged in-between Thessaly and Boeotia, thus dividing the regions of central and southern Greece and allowing only for a narrow shoreline passageway between them. Due to its key geopolitical location at the crossroads between powerful Mycenaean palace states on either side (Iolkos, Orchomenos, Thebes, Glas) and other adjacent areas with strong Mycenaean presence (Lokris, Euboea), this region could exert control on land routes and regulate local and interregional trade. The Spercheios valley, covering a flat area of 370 sq. km, is nearly land-locked, surrounded on three sides and protected by mountain ranges that delineate clear regional boundaries, allowing, however, eastward access to the sea.The hydrologic system of the Spercheios River, meandering toward its delta-shaped outlet in the Maliakos Gulf, with its six tributaries form a well-watered fertile valley with rich alluvial soil (described by Homer as “large-lumped”) and its own micro-clima, agronomically ideal for large-scale agriculture in terms of land size, irrigation, and soil quality. Finally, the Homeric poems, epic poetry, and Greek mythology traditionally connect the Spercheios River with Achilles and his kingdom in Phthia, thus preserving the collective memory of a palace state in the region. Paradoxically, however, the archaeological map of the Spercheios region is incompatible with its geopolitical importance and economic potential. In the last two centuries, archaeological fieldwork was carried out sporadically in the Spercheios valley with rather poor results, partially because field research often aimed not at the surrounding hills (habitual location of Mycenaean settlements) but at the modern valley floor, therefore, being hindered by local geological processes (deep silting from the river and sinking of the southern part of the valley floor by 10-20 meters due to the earthquake fault of Atalanti). Recent work by the local archaeological Ephorate has located and partially excavated a few Mycenaean sites and cemeteries, such as the important cemetery at Kompotades that has yielded large chamber tombs with exquisite finds, imported luxury goods, and artifacts of high social status, thus indicating a region that may be moderately secluded but not isolated, combining local autonomy and self-sufficiency with interregional contacts. 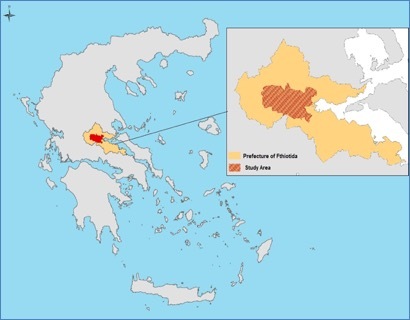 A new five-year field project commenced in 2018 under the directorship and auspices of the local Ephorate with the collaboration of Dickinson College, the Geophysics Lab of the Aristotelian University of Thessaloniki, the Architectural Design and Research Lab of the Democritus University of Thrace, the Archaeometry Lab of the University of the Peloponnese, and the support of the Municipality of Lamia and the Mycenaean Foundation. The Mycenaean Spercheios-valley Archaeological (MY.SPE.AR.) project combines extensive and intensive archaeological survey, aerial reconnaissance, geophysical survey, targeted excavation, and digital technology in order to locate, identify, and map all Mycenaean sites in the Spercheios valley. Geospatial analysis of geocumulative approach (involving archaeological, geomorphologic, paleo-environmental, hydrographic, and paleo-climatic variables) is conducted to explore interaction between environment and site distribution. Furthermore, statistical, frequency, and spatial distribution models are applied to trace contact patterns and hierarchical dynamics among the sites, and to identify second order centers and possibly a first order administrative center in the region. 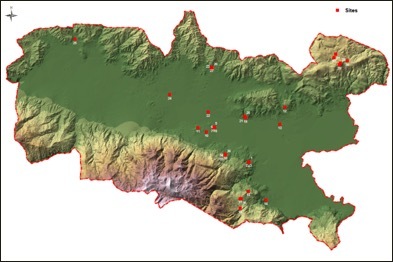 Our field research has identified a potential candidate for a regional administrative center in the ancient citadel of Lamia (Akrolamia) on the basis of geopolitical and topographical parameters, promising geophysical data, and old test pits that yielded Mycenaean wall remains and palatial ceramic evidence. Anyway, the strategic and economic potential of the region practically eliminates even the remote possibility of a geopolitical vacuum in the area. Nevertheless, if verified by excavation, the presence of a regional administrative center on the Akrolamia, once controlling land trade routes, commanding access to the shore, and regulating the regional agricultural production, would drastically change the political geography in the periphery of the Mycenaean world. This project, therefore, will seize the rare opportunity to combine field archaeology with advanced archaeological science and traditional classics, and may face the challenge to juxtapose historical reality with myth. Researcher, Department of Anthropology, Yale Univ.